With the big change to the forums being the addition of Trust Levels the nature of the forums has changed and new trends have popped up. One of the things that has been big is Off-topic conversations. While sometimes the nature of a conversation evolves we have to try and stick to the topic as best we can and think about our posts before we hit "reply". @Hanna_Brassheart and @Nora_Wrenchfizz1 have been doing a great job of trying to keep people on topic but I have seen times that they have said it multiple times in a thread which must be tiring! So I am thinking that we might have to be a little harder on off-topic conversations after it has been mentioned already to keep on topic. What I mean when I say "harder on off-topic conversations" is that we may have to start deleting off-topic conversations to try and keep the thread clean and easy to read. While we aren't trying to stop you from talking about things, we want the topics to stay on the topic they were created for so they are easy to read. For instance, if I ask a question about how to defeat Bucktooth I would want to read replies about fighting him and what I can make/use to beat him fast, it would be a lot harder to get that information if in the same topic someone was having a conversation about how to make the best chip and dip. If you have a thought that is off-topic, you can "@" someone to a topic that is relevant to your thought or create a new topic and "@" that person. Alternatively, Random Anything is a great topic to have general conversations. Here, Here! Way to nail it with the hammer @Goku_Ironheart! I confess I have gone off-topic myself! I'll try hard not too! We an write the off-topic stuff on Random Anything. Maybe Pin it so everyone can see it better @Goku_Ironheart? Everyone goes off topic from time to time, I have done it too! I meant Random Anything, but that works too! Haha oops, just edited the post to add that in, thanks @Jacoby_Elderfun1! @Nora_Wrenchfizz1 You bring up a great point of Flagging posts, which I really meant to put in this post! But I will just have to talk about it now. 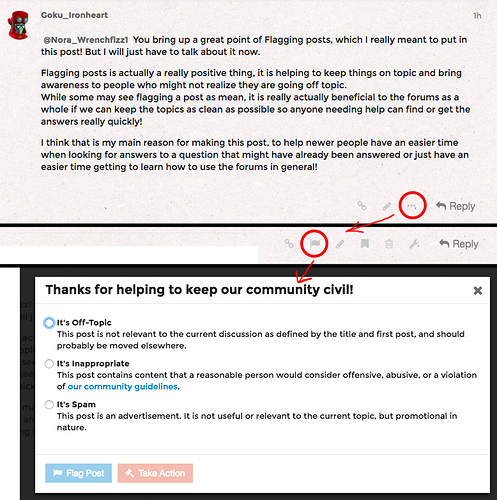 Flagging posts is actually a really positive thing, it is helping to keep things on topic and bring awareness to people who might not realize they are going off topic. While some may see flagging a post as mean, it is really actually beneficial to the forums as a whole if we can keep the topics as clean as possible so anyone needing help can find or get the answers really quickly! I think that is my main reason for making this post, to help newer people have an easier time when looking for answers to a question that might have already been answered or just have an easier time getting to learn how to use the forums in general! @Skybie_Jumpdust1 just thought would post here cause it was a good question! 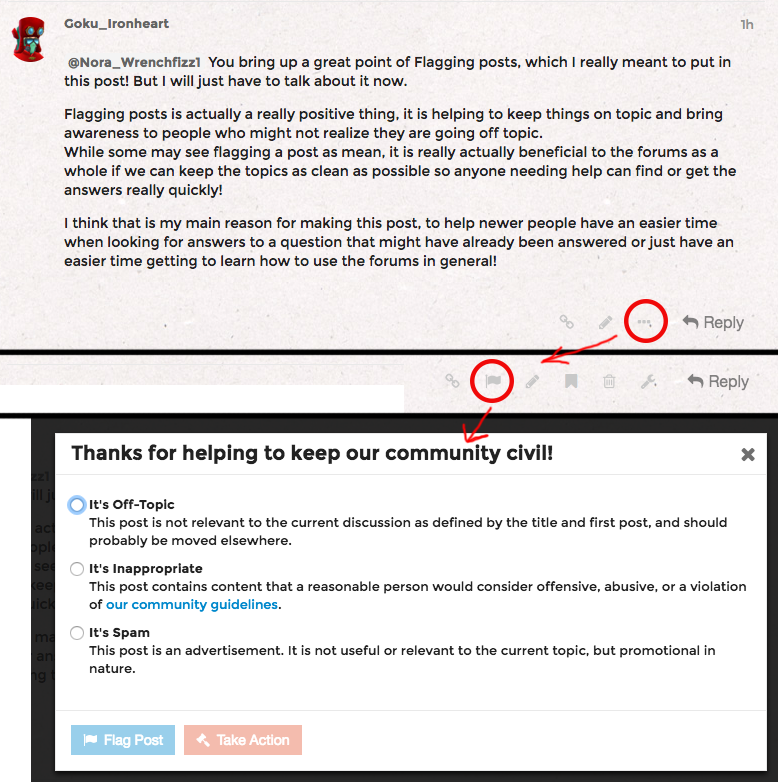 Skybie asked what flagging is, flagging is a way to notify a moderator of a post that might be off-topic, inappropriate or is spam. So if there is a post that breaks the rules you can click on the three dots under a post next to the "Reply" button (Where I have circled in red) and click the Flag that shows up it will open a small window where you can then choose how it breaks the rules. Once you have then done that and clicked "Flag Post" a Moderator will be notified so we can look into it. @Nora_Wrenchfizz1 yeah, I am glad you brought it up also! Remember that you can ask us anything at all, you don't need to feel weird because you don't know the answer, we can't know all the answers. Learning is a great part of life so it's best to ask all the questions! I didn't know you can take action.